Gushing---so don't read if you can't take it!! Quite often I read about artists who are depressed, lacking in self-esteem or self-confidence, have doubts about the quality/worth of their work, and generally have negative feelings about their art and what they are producing (or not producing). I am always grateful to realize that I don't have these feelings. I have been so fortunate to find success and happiness in what I am doing with my art and as a "glass half full" kind of person I just don't get those negative thoughts about it all. I've had people make comments to me about how I can look at my show ribbons whenever I am feeling down about my art and feel better. 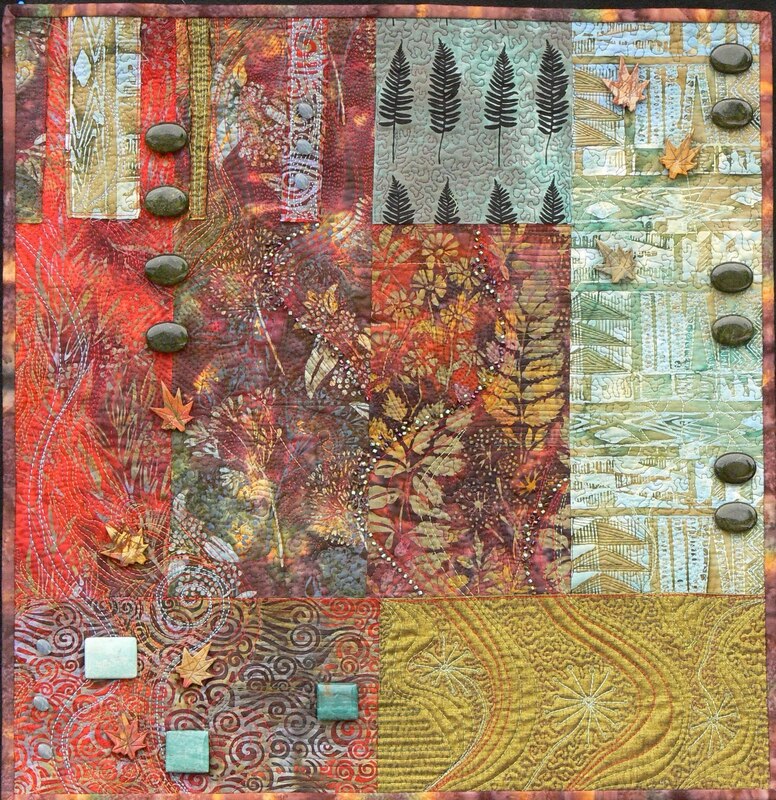 In the three years that I have been seriously pursuing my art quilts I have not had a time when I felt negative or down about what I'm doing! It has been a fun, positive, rewarding and fulfilling journey. I love what I'm doing and am proud of my work. I have had more support from people in many different capacities than I could have ever hoped for. It is usually accepted that friends and family will be kind, but I have had such an overwhelmingly positive response about my work from an incredible array of people that it is just plain wonderful. It is all new and exciting to me now, so maybe sometime down the road I'll need to think back to these happy times of satisfaction with my art in order to boost my spirit. Every time I enter a show and get accepted I am astounded, flattered, and proud. When I win an award at one of those shows I am truly honored. When I take my work to a gallery and they accept it and want to show it I am elated and encouraged. I hear that many artists are still not selling much with the economy not recovered and people not spending on "luxury" or discretionary items like art. I have sold more work this year than any other year. I'm going to have to remove those lines of "sold" pieces on my inventory list so I can sort out what is still available without all those sold ones in the way! Now, that is not to say I don't have my problems, but they are what I would consider "good" problems. I don't have time to crank out all the work I have inspiration for. I am constantly in the process of getting an entry ready for a show, shipping a piece to a show, or trying to determine what pieces to commit to shows I want to enter down the road. It is getting to be a major organizational effort to coordinate the commitment of pieces to shows and make sure they aren't sold in the meantime or committed to another show, or that I have them back in time to send to another commitment. I have pieces in four galleries in my area and keeping them up-to-date and current is a coordination effort as well. I think I'm going to have to slow down and commit to a certain number of shows a year and choose those that will be the best exposure for me. I have been in numerous Mancuso managed quilt shows and they have been a good experience for me but I think I will be giving those up. I'd like to try for Houston and Paducah even though they emphasize the traditional quilt because they are prestigious and will get my name out there. 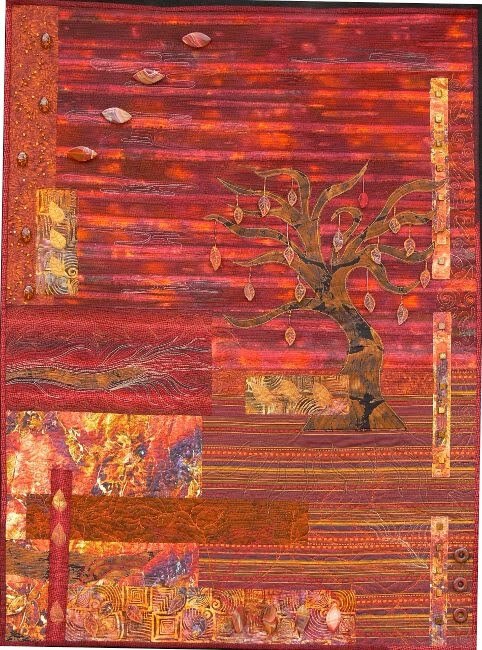 I'm trying to enter more of the art quilt shows at galleries across the country because they emphasize sales and many of them have become quite prestigious in the art quilt world. That includes shows like Quilts=Art=Quilts, Art Quilts XV, Form Not Function, and many others. I have yet to get into one of these shows, but I'm still trying! When I do an entry for a show it can be rather complicated to figure out what I can enter. For one thing it needs to be available (not at or committed to another show) and not in a gallery because it cannot sell in the meantime or it might not be available to show and they don't like that much. There are size requirements (minimums and maximums), show themes, and image requirements. 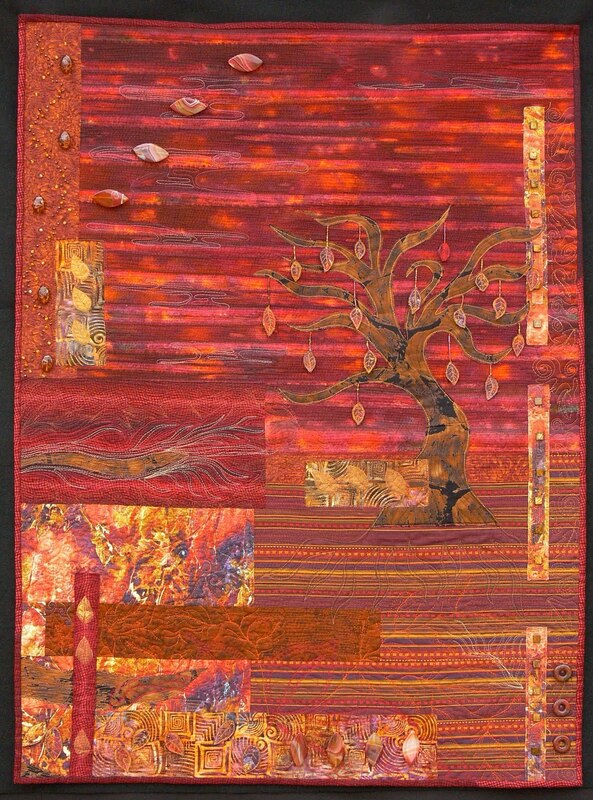 I have to make sure I have good quality full quilt and detail images of my pieces so they are ready to submit. There are fees to pay, shipping arrangements to make, packing quilts so they arrive ready to hang in decent condition, worrying about them getting lost in shipping, worrying about the condition they will be in when they are returned to you, anxiety about whether or not they might win a ribbon and be recognized in some way, and, for some shows, if they sell. My mind races! This summer has been particularly busy for me having been the featured art quilter at our local show and of course having my son here to occupy my mind and time. He is a good boy and can entertain himself, but there are not nice blocks of time in the day when I can really become lost in my work. Because of that I don't accomplish as much. We have had a great summer and I enjoy having him around, but when school starts I have a whole list of things that I will be attempting to accomplish with all the uninterrupted time I will have during the week! We'll see how that goes...! 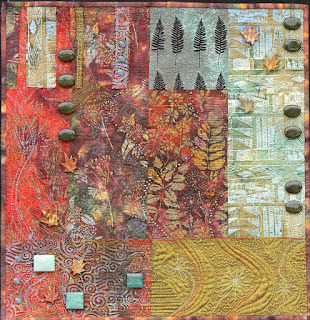 Now I am moving on to some small pieces that are pieced and layered and ready to quilt. I'm hoping to accumulate some things to sell for the holidays, in particular a holiday show at the Daly Mansion in Hamilton, Montana which seems to be a very strong and successful venue for artists. I have applied to have a booth space and it will be my first foray into that sort of display of my work. I think it will be fun, but I really need to get a good inventory of work to sell so I don't have a naked booth! 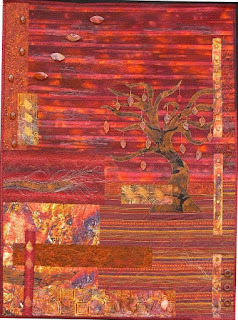 I previously blogged about a piece that I worked on for about a year called "Red Sky" which went to the Lowell Quilt Festival in Lowell, Massachusetts recently and is now headed to AQS Des Moines. It has tentatively been sold and I'm hoping that becomes a permanent thing, but I need to get it back safely first. It is a wonderful piece and I know that the new owner will enjoy it. I will be getting some new images posted on my website soon and will put a notice here when that happens. 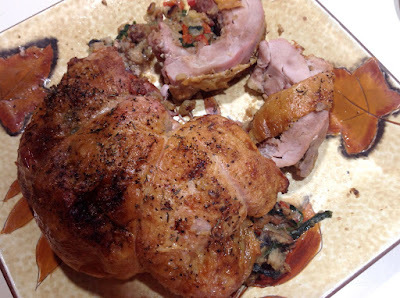 I need to get to formatting the images and writing up the descriptions so I can have my husband put them out there. It all just takes time..................................!! Just for fun, this is a piece created a while back to try to get into a show entitled "Art Meets Science", but it did not get in. 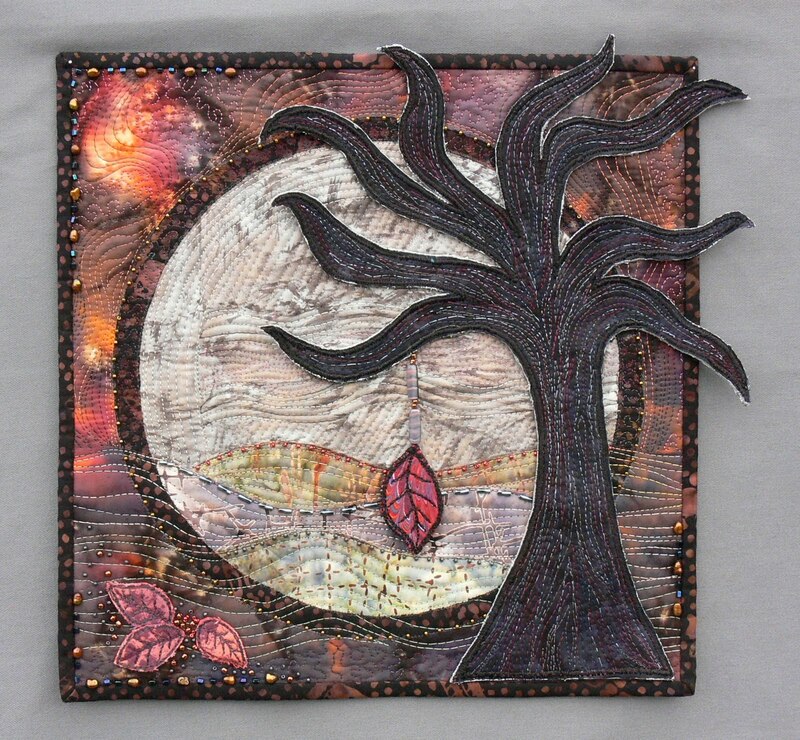 The moon in its phases is created with shiny/sparkly angelina fiber. There are carved beads of bone and metallic glass beads which are to symbolize the primitive and yet space-age aspects of the moon. One of the few things in science that I can think of that is both primitive and modern at once. I finally figured out how to get some photos downloaded here so I'm getting back to posting! I have had some fun this summer getting my work out there and even selling! At the beginning of July we had the Stevensville Sapphire Quilters' Show and I was the Featured Quilt Artist. That meant I got some floor space to myself to set up a display of my work and I filled it up with fiber art! I was able to borrow some free-standing panels for displaying some of the work and they were black so they set off the quilts nicely. I had some of my older pieces as well as new work. It was very fun to be there for two days and talk with people about my work and answer questions. I sold three pieces and received some ribbons for various pieces I had entered in the show. Here is a picture of one of the pieces I sold which I will miss! It is called "Run Free". The quilt show went very well and the two ladies who were brave enough to volunteer to organize and run the show did a wonderful job with it. All of the committee chairs seem to have things well under control and I thought the show looked wonderful and things ran smoothly. The vendors seemed to be happy and the visitors seemed to enjoy it. I know that I had a great time and thoroughly enjoyed the weekend! I took some of my work to a co-op gallery in Missoula, Montana, The Artist's Shop, to get juried in for consignment there and was accepted so some of my pieces are hanging there now. I don't think anything has sold yet, but it is good to have some of my work in Missoula. I will be having a solo exhibition at the gallery in September of 2011. My son, Michael, is going to be the featured Emerging Artist at River's Mist Gallery in Stevensville for the month of August. His opening will be on First Friday (August 6) from 6-9pm. I can't wait to see him interacting with people at the reception. Some of his work will be for sale, but he is rather attached to it and most of them he doesn't want to sell. His work is mostly watercolor paintings which he has created during lessons with my dad which he has been doing most every week for a couple of years now. He has done some very nice pieces and I think people will really enjoy them. 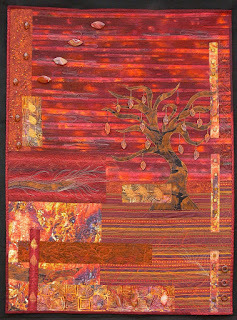 I just sent two pieces off to Images 2010 – Lowell Quilt Festival in Lowell, Massachusetts. Here are images of the two pieces I sent: "Blackberries and Dandelions" and "Red Sky".